Just before all of the signs of Summer fade into Fall, you can enjoy this great tropical smoothie. 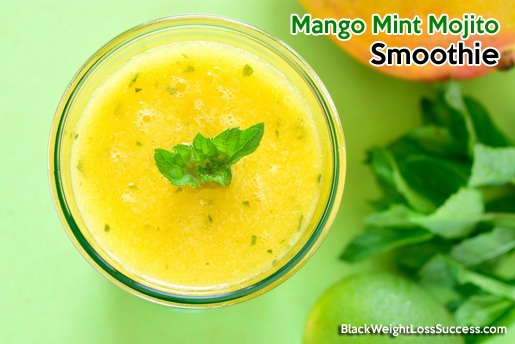 This low calorie drink is half Mojito/half smoothie…no alcohol. Feel free to add a little protein powder or a few tablespoons of Greek yogurt to the recipe if you would like for more protein. I’ve suggested frozen mango, just in case you can’t find fresh ones in the stores anymore. Half mojito, half smoothie. This drink will let you slip into a tropic state of mind anytime of year. Load the ingredients into your blender. Start with the solids and then add the juice and coconut milk. Add a few pieces of ice if you would like a very frosty smoothie. Use 2 tablespoons of sweetener instead of one if you want a very sweet smoothie. Don't forget to add in those calories.